It's Close Encounters of the J.J. Kind. 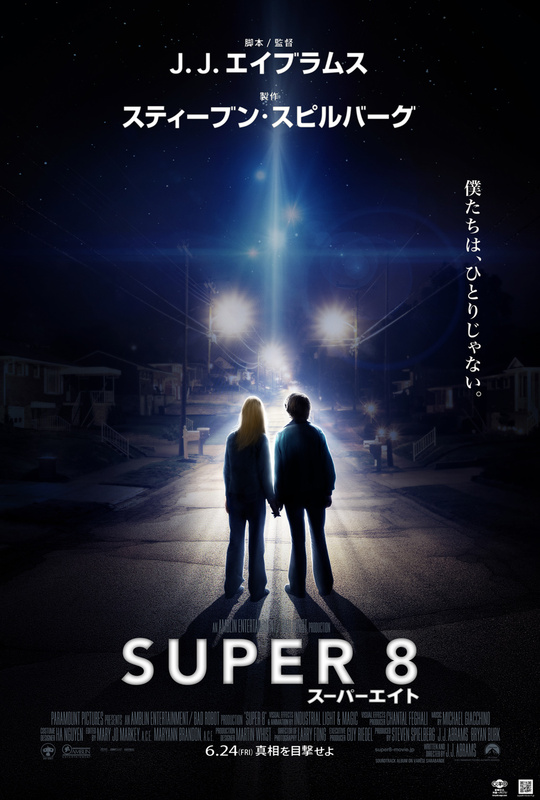 We are very excited to debut the official Japanese poster for J.J. Abrams' upcoming sci-fi movie Super 8 tonight, as you'll see below. Paramount has asked us to unveil this spectacular new poster to the world and I'm more than happy to do so, as this is the movie I am most excited to see this summer! The imagery, which has never been seen before, has a very Close Encounters of the Third Kind vibe to it, which makes sense considering the film is an homage to Spielberg's sci-fi classics of the 1970s, but I know Abrams' has crafted his own exciting, original story for the movie. Check this out! Be sure to watch the official trailer for Super 8 if you haven't yet. Only a few weeks left until it hits theaters! Relationships are tested when a small town experiences extraordinarily fantastic "other-worldly" events. This sci-fi film stars Joel Courtney, Zach Mills, Elle Fanning, Kyle Chandler, Noah Emmerich, Ron Eldard. Super 8 is both written and directed by visionary director J.J. Abrams, who started his career with "Lost" and "Alias" before first directing Mission: Impossible III then Star Trek last summer. This is being produced by Steven Spielberg at Amblin, Relativity and Bad Robot. According to early reports, this was inspired by Spielberg's sci-fi films from the 70's and 80's. Paramount will be bringing Super 8 to theaters everywhere starting on June 10th this summer. You can stay up-to-date by visiting: super8-movie.com. Are you kidding me?! Have you never seen a sci-fi movie in your life? Look at that, this poster is the definition of spectacular! I think it's awesome! Spectacular!!?? b/c not even 30% is occupied by the actual content?? You don't have to try to sell every post so hard with words like EPIC and SPECTACULAR, people will still click the links and read the news. Because of the lights in the background signifying the aliens/spaceships and crazy things about to happen in the story. It's a spectacular poster, there is really no denying that. I am honestly baffled, stunned, SHOCKED, that you don't see that. Love you Alex, but Abrams got his start on Felicity and even before that wrote the film Armageddon and more. Awesome poster, but kinda spoilery. Makes it look like there's more than one alien..
Sweet poster. Looking forward to this. Hope it fills the somewhat void of LOST. I love those type of things that get you gitty wanting more info when its just teasing you. "Boku-tachi ha, hitori jyanai." - The tagline in the poster in romanized characters. WE ARE NOT ALONE - translation. Seems epic. So far, only Fast Five lived up to the hype of any of the summer movies so far. looks pretty good,still not sure about this movie. the teaser trailer was brill,but the full trailer wasn't all that. Looks really, really good. Great poster. Ah man, I was hoping the monster in this was created by the government...oh well, still looks very interesting! Really? Breathtaking? Hardly. This poster is mediocre at best. I think Abrams gets WAY to much credit. To the point that anything with his name on it must be amazing. The movie might be good but the only thing people are geeking over is his name. .........that's me STILL waiting to get excited about this movie. @ Daneforst I hate people that are as judgemental as you. I know your entitled to your opinion, so heres mine: You should have been swallowed.